Post Processing Injector for Dark Souls PTD to provide a seamless immersive experience. Upgraded visuals at negligible performance impact. Works with all mods including DSFix and HD textures. Try it in-game: Prepare To Be Blown Away! 27/01/2014: Mod overhaul. New Immersive and Legacy presets. 24/01/2014: Minor changes to solve a rare brightness issue. 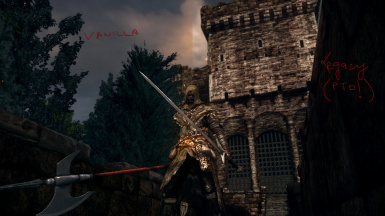 SweetFX is a universal image improvement and tweaking mod with a goal to provide video processing tools to games in real-time. 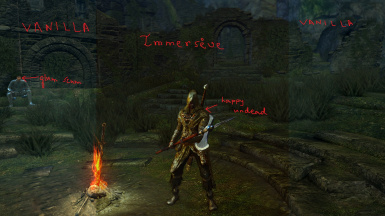 These are my personal SweetFX profiles for Dark Souls with an objective to provide lore-friendly and realistic aesthetics. I am sharing these profiles so that you can try them and enjoy yourselves. Believe me when I say that screenshots do not do these justice: try them in-game and prepare to be blown away. At the most, it will take you five minutes to try these out. Finally, don't forget to ENDORSE and VOTE this mod if you feel it deserving of your praise! Also, spread the word so that others may enjoy the mod as well. 1) The Immersive preset comprises of various tweaks to enhance the visuals subtly, taking care not to cause undesirable distraction to the player. No fancy cinematic effects have been used. SMAA is used instead of FXAA for better approximation and to avoid too much blur. Simulated HDR is used to promote a more dynamic feel, but the intensity is kept balanced so as not to overwhelm the player. Lumasharpen is used to sharpen the image and give it a realistic and rough HD look. The strength is kept low to prevent the anti-aliased edges from becoming jaggy again. Cineon DPX is used in moderated strength to give a sunny look to the image without being overwhelming. 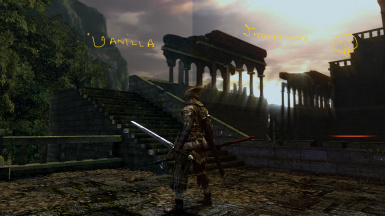 Vibrance is used to increase saturation just a little so as to prevent the washed-out look and immerse the player better in the gameworld. Curves is used to increase contrast a little in order to better define highlights and shadows, and to give the metallic objects their characteristic lustre. Also helps prevent the washed-out look. Sepia is used to give the image a slight cold forbidding tint to match the bleak gothic tone of the game. 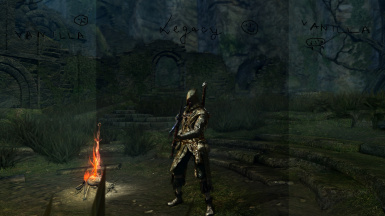 2) The Legacy preset is designed to provide a dark, cel-shaded appearance, somewhat similar to Demon's Souls and Dark Souls 2. It is meticulously tweaked to fit in with the overall theme of the game. Neither SMAA nor FXAA is used and I would advise against any other form of anti-aliasing as well, to preserve the hand-drawn look of the artstyle. Explosion is used in minute amount to scatter the pixels and render a slight fuzzy look to the image. Cartoon is used to impart a characteristic cel-shaded look that complements the graphic style really well. Technicolor is used to give an archaic, uninviting feel to the land of Lordran. Vibrance is used to desaturate the image a little in order to add to the bleak, hopeless vibe of the game. Curves is used to increase contrast in order to make the highlights and shadows more noticeable, and also to better define metallic lustre. Vignette is used to simulate real and photographic vision and further darken the image a bit. Dither is used to simulate more colors than your monitor can display, thus creating the illusion of "color depth" and preventing banding artifacts caused by Vignette. Download BOTH the Main File and ANY ONE of the Update Files manually and extract them to the root game installation folder where your DATA.exe and DARKSOULS.exe are located. Set the ingame brightness to 5 and the anti-aliasing to off. If you also use DSFix, set anti-aliasing to 0 in DSFix.ini. Also, my recommended settings for DSFix DoF are 810 for resolution override and 1 for additional blur. To uninstall, simply delete all of the files that you previously extracted, from the game folder. PRINTSCREEN - Take screenshots,which are stored in the main game folder, where you installed SweetFX. SCROLL_LOCK- Toggle SweetFX on/off ingame. PAUSE - Reload the SweetFX settings ingame. Very handy if you modify the settings while running the game. Keys can be reconfigured using the injector.ini file that comes with SweetFX. This works with all mods, including DSFix and HD textures. No incompatibilities reported so far. 1.1(24/01/2014): Minor changes to solve a rare brightness issue. 2.0(27/01/2014): Mod overhaul. New Immersive and Legacy presets. I cannot be held responsible for any harm that this mod may cause,so use this at your own risk! Presently, it is impossible for me to provide any kind of support for this mod due to real-life circumstances and I apologize for the inconvenience. I may upload more SweetFX profiles in the future. Any feedback is highly appreciated, whether complaints, suggestions or requests, but please excuse me if my replies are late or absent, though I shall try my best to tend to comments once in a while. Also, English is not my mother-tongue, so kindly excuse any linguistic/grammatical errors on my part; rather point them out (if any) so I may rectify them.